A day dedicated to celebrate Womanhood. Women, the equals in this world who have contributed sometimes silently, sometimes lovingly but always graciously , women who have stood up for the righteous , fought for what is theirs to take the inspiring role models to look upto . 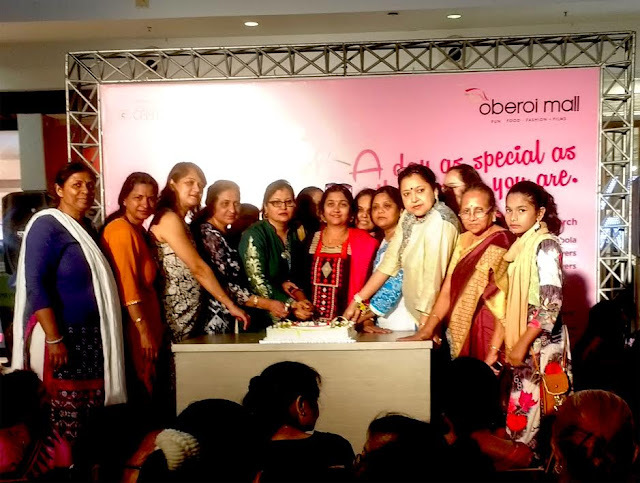 Oberoi mall celebrated womanhood by recognizing such gems in day to day life. Oberoi Mall, one of the most fashionable shopping destination to shop in Mumbai was no different in applauding women and their special day. Every wednesday is earmarked as Women's Wednesday by the mall and this wednesday it became extra special. They ran a campaign looking for women who rose to occasion when situation challenged them and shone , we call them achievers. Rachna Padia always dreamt of becoming and a Doctor , despite family opposition she stood her ground and defied everyone to become a doctor. Pooja Jogi wanted to travel, which she did in style. She has travelled over 2 lakh Kilometers on her bike, now that is one stylish way to take the deem road literally. Being from a small town in West Bengal and only girl student in the class of 24 boys, Ms Bani Rana pursued her dream and attained the status she dreamt of by completing her Masters in Physics. With at most dedication and will, Ms Navanita Parmar at the age of 69, not only runs Bharatnatyam academy for the commoners, but also imparts the technicality of the skill to differently abled kids. They were all felicitated and applauded at a very special celebratory event organised at the mall.